Aly Dosdall: Tuesday tip and sneak peek! Tuesday tip and sneak peek! 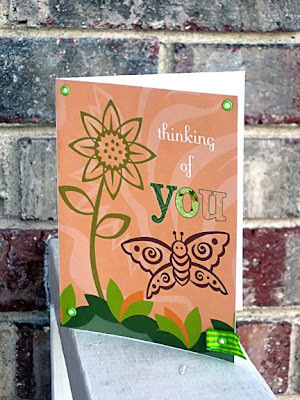 I made this hybrid card using Cheryl Welch's new Zoo Parade kit available tomorrow at pcLayers.com. I printed the card on white cardstock, and then added the eyelets and the ribbon. I love the spring colors and adorable animals in this kit. Can't wait to use it on zoo pics in the summer! Now for the tip: I use a point and shoot camera (can't afford a DSLR...maybe someday...) but to get better shots with slightly blurred backgrounds I keep my camera on close up mode almost all the time. Of course this means I have to watch out for "camera shake". I do this by either using my lightweight ebay-bought tripod, or if that isn't convenient, I try to steady the camera on something nearby, or I just press my elbows up against my body and push the shutter release button AFTER I BREATH OUT. Amazing what a difference that can make...my hubby says that's what they teach the scouts when they shoot rifles...must be true, then, right?? =) Give it a try!